Happy Friday and thanks for taking the time to visit the Great Impressions Blog. Spring has finally come to the Pittsburgh area. We have had a beautiful week of sunshine and warmers temps. I have flowers blooming in our gardens. And, I was able to cut some hyacinths and bring them indoors. Looking at them in the vase reminded me of this Great Impressions Stamp -"jars of flowers" F262. So I decided to create my card using this image. Love it when I get inspiration from what I see around me. I stamped and then colored the image with Prismacolor pencils and gamsol. I cut the image with a Spellbinders oval die. The background paper is from the fab Echo Park collection "sweet girl". We are now carrying it in the online store. If you like bright colors as I do, this collection is definitely for you. My card sentiment is the Great Impressions Stamp - "little pleasures" C402. Well that's it for me for this week. Hope to see you back here again next Friday. Such pretty colors Mary! Love the sweet little bow. This is a very bright and cheerful card. 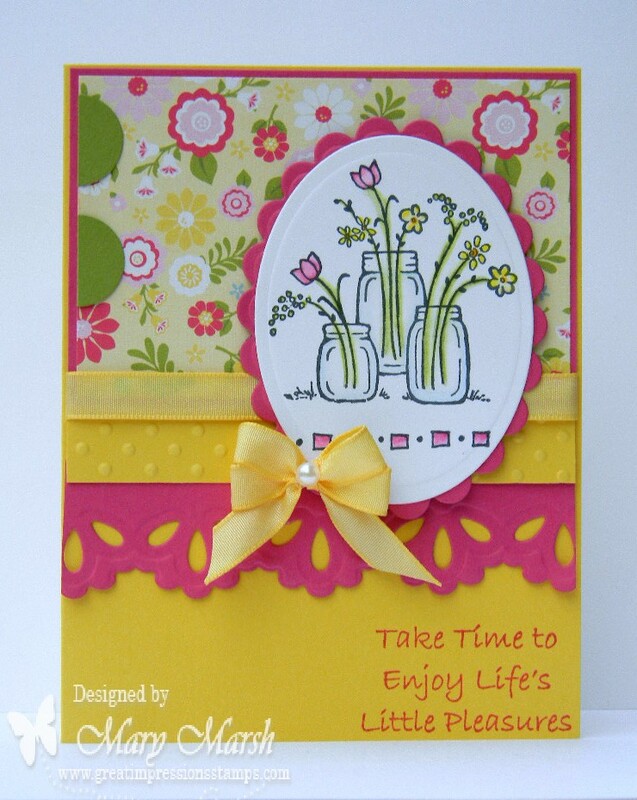 I like the way the design paper picks up the flowers in the stamped image.